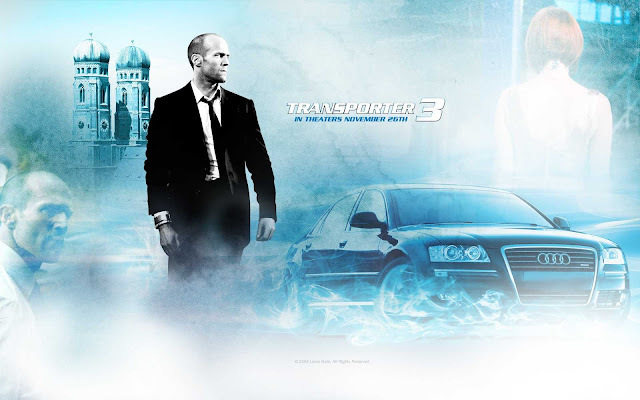 Transporter 3 (French: Le Transporteur 3) is a 2008 French action film and the third installment in the Transporter franchise. Both Jason Statham and François Berléand reprise their roles, as Frank Martin and Tarconi, respectively. This is the first film in the series to be directed by Olivier Megaton. The film continues the story of Frank Martin, a professional "transporter" who has returned to France to continue his low-key business of delivering packages without question. "A ship arrives, carrying toxic chemicals that have killed two of its crew members. Frank Martin and Inspector Tarconi fish in the Marseilles when Tarconi receives a call about a black Audi A8 that has sped past French customs and evaded the police in a car chase. While Tarconi returns to headquarters to give Frank's alibi; in Odessa, Ukraine, the Environmental Agency Minister, Leonid Tomilenko, receives a threat from Ecocorp boss Johnson to reopen business negotiations. At night, the Audi crashes into Frank's home, with a wounded transporter, Malcolm Melville, whom Frank had referred when he declined a previous job. As paramedics take away Malcolm, Frank discovers a woman in the back seat of the Audi who warns him not to take her from the car; she shows him a metal bracelet she and Malcolm have been wearing. Frank rushes outside, but the ambulance explodes, killing Malcolm. Frank is then knocked out by one of Johnson's henchmen. Johnson places an explosive bracelet on Frank, forcing him to take a package and the woman, Valentina, to Budapest. Tomilenko negotiates to postpone signing Ecocorp's agreement that would allow the ship with the chemicals into his country. While Tarconi researches into Johnson's motivations, Frank goes off-course, visiting a garage to try to deal with the bracelet, but as he fends off Johnson's men, his mechanic friend Otto cannot disarm the device on the car. At Budapest, Johnson tells Frank that he's fired; one of Johnson's men steals the Audi, leaving Frank to chase him down. After Frank and Johnson agree to call it even, Johnson sends him to Bucharest, but Frank and Valentina are chased by a black Mercedes-Benz E-Class driven by Tomilenko's agents. After opening the package in the trunk, Frank realizes Valentina is the real package; she then seduces Frank by holding his car keys. Valentina, who is revealed to be Tomilenko's daughter, explains that she was drugged in Ibiza and was transported by Malcolm in order for Johnson to blackmail her father. Johnson redirects him to Odessa, where he and his men surround them on a bridge. Although Valentina is delivered to Johnson and her bracelet removed, Johnson's men shoot at Frank's car. Frank drives off the bridge into the lake; fooling Johnson into believing that he is dead whilst surviving by using the air from the car's tires to inflate a buoying device. Aboard the train, Johnson lets Tomilenko talk to Valentina and gives him 15 minutes to sign the contract. After Tarconi and the Ukrainian police retrieve Frank and the Audi; Frank continues his chase and jumps the car on top of the train containing Johnson and his men. He takes out all of Johnson's men but cannot touch Johnson because he is too far from his car. After Johnson separates the train cabs, Frank jumps his car into the cab, and beats Johnson; strapping him with the bracelet and sending his car into reverse resulting in Johnson being blown into pieces. Upon hearing from Tarconi that Valentina is safe, Tomilenko tears up the Ecocorp contracts before heading for his business conference. The cargo ship is raided by police and sent away from Ukrainian shores. Frank and Tarconi return to fishing in Marseilles, but Valentina suggests they eat out instead."